To the SNA TIG Hompage! Become a Member of the SNA TIG! 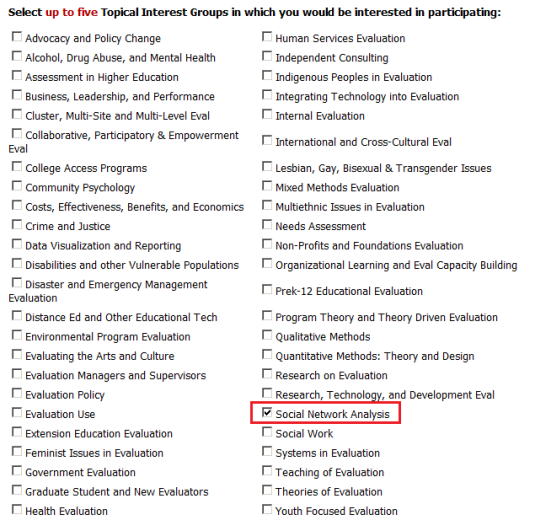 To become a member of the Social Network Analysis (SNA) TIG, you must be a current member of the American Evaluation Association (AEA). Once you are an AEA member, you can join the SNA TIG by logging in and updating your AEA profile. To log into your AEA profile, enter your username and password in the fields at the top of the red side banner on the left. Once logged in, select "Social Network Analysis" as one of your five Topical Interest Groups, and you'll become a member of our growing community! Copyright 2018 AEA Social Network Analysis TIG. All rights reserved.